As you can see here, code hacker Jane Manchun Wong has located a new test which renames messaging as ‘Chats’ and keeps those interactions in the main app, as opposed to opening in Messenger. 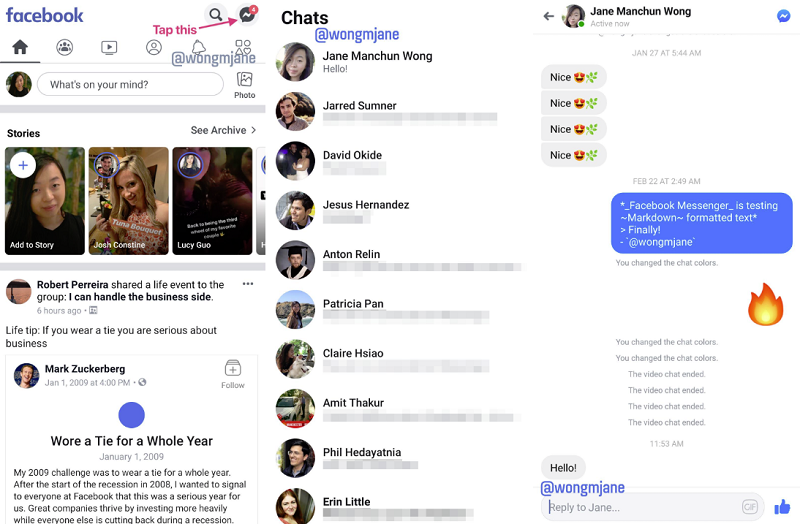 Wong notes that the ‘Chat’ option does not include all the messaging functionality available within Messenger, but it would enable users to interact within messages without having to switch to the separate app. Facebook initially had its messaging tools integrated into the main platform, but spun them out into Messenger back in 2014, controversially forcing users to download Messenger to maintain connection with their friends. That gave Facebook a whole new, multi-million (now billion) user platform, but the company was largely criticized for the play, and the Messenger app was savaged by reviewers as a result. Now, with Facebook planning to lean further towards private messaging, and eventually integrate its various messaging platforms, it’s apparently looking to roll back its approach. The change could make it easier to connect with users via messaging, but it could also take some of the focus away from Messenger as a connective platform. As noted, there would still be functionalities within Messenger that would not be replicated in the main app, but if users don’t need to switch across the Messenger to maintain their conversations, maybe they won’t, which could impact overall Messenger usage. Facebook could be building a challenge for itself – if users don’t have to switch to Messenger, maybe Facebook is tasking itself to make the Messenger app more appealing, with new tools and features designed to continue to draw users in. Or it could be trying to better balance on-platform engagement across the two apps – while Messenger use has been rising, engagement within Facebook’s main app has, reportedly, been in decline. By enabling messaging on Facebook, maybe it loses some engagement on Messenger, but gains some on Facebook, better balancing its overall time spent, and augmenting its subsequent ad potential across the two. Either way, it’s an interesting consideration – there’s no word on any official roll out as yet, and we’ll keep you updated on any changes.